Wilted Winter Greens | "Il faut goûter"
This Fall I have a new love. Greens. In fact, there are three. Mustard Greens, slightly spicy. Turnip Greens, a bit more bitter. And Kale, hearty and slightly herbal. All together, they make a standout side dish that comes together in minutes. There’s bacon, onions, garlic, mustard and warm balsamic vinegar. Enough savory flavor to make anything enticing. Serve these greens to someone who “doesn’t like greens” or, more horrifying, “doesn’t like vegetables,” and then call yourself a mighty Converter as they lap them up with a surprised smile. Also, this would make a great Thanksgiving side dish! Today, they made a satisfying lunch with some fresh bread and creamy Camembert. Bon Appétit! This recipe is to taste, but I’ll give rough measures. It’s best with a combination of at least two varieties of greens. Fry bacon in a large skillet until the fat is rendered out and the meat is almost fully cooked. Add the garlic and onion and sauté until onions are soft and translucent. Pour in 1 tablespoon Balsamic vinegar and 1 tablespoon Dijon mustard; mix with bacon, onions, and garlic. Add the fresh greens to the pan (they will wilt down significantly! ), and pour in 2-3 tablespoons of water. Stir so the liquid coats the greens, then put a lid on them over medium heat and let them wilt for 2-3 minutes until they begin to lose their brightness. Remove the lid, stir the greens, and taste for seasoning. Add salt and pepper to taste, and add a bit more vinegar or mustard as you desire. 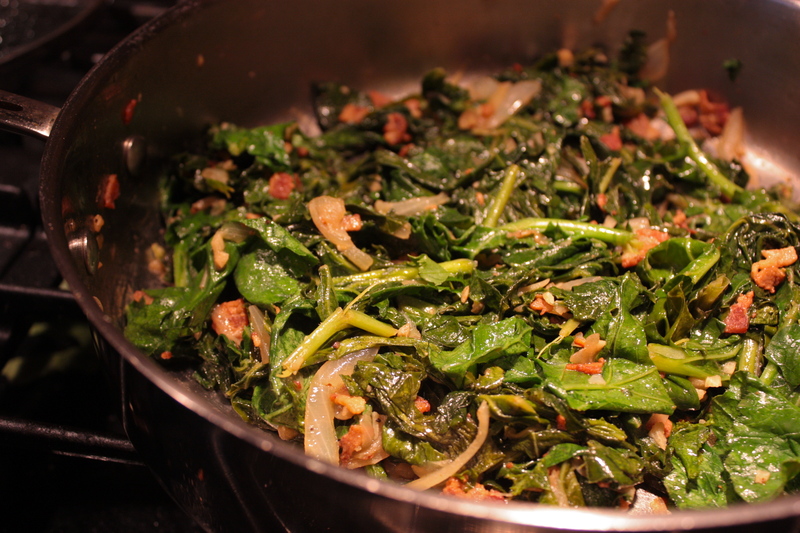 Cook (wilt) them over medium heat until desired tenderness (fresher greens are more tender than older ones). Serve immediately. 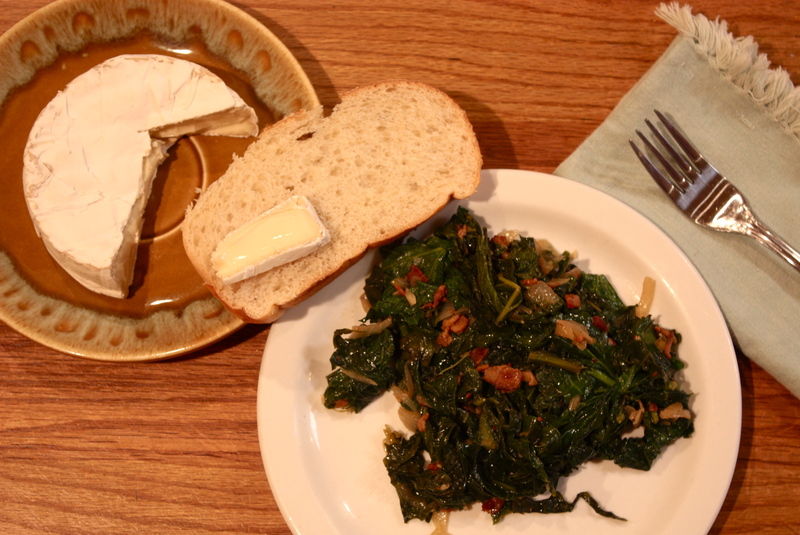 See these greens as a brunch star here! 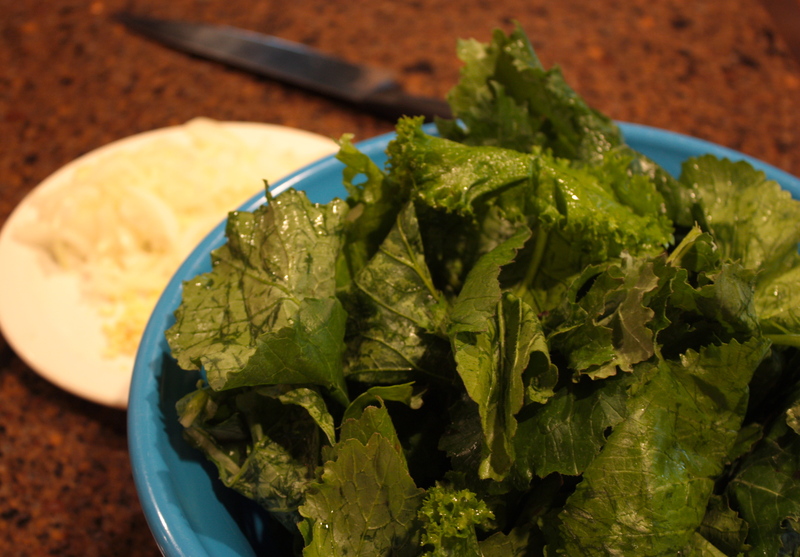 This entry was posted in Savory and tagged food, kale, love, mustard greens, recipe, Thanksgiving side dish, turnip greens, winter greens by needtotaste. Bookmark the permalink. Yum and I have some turnip greens in the fridge. I love the combination here. The mustard greens in particular are effing transcendent with bacon and mustard. I want to eat this RIGHT NOW. Go and do! And cook! and EAT! I rarely cook, as you know, but this post is making me want to try. I love greens and lament the lack of finding good pre-prepared versions. So I promise to make this at some point. Also, I’m requesting a winter drinks post! Your mulled wine recipe, hot toddies, tantalizing teas, spiced up ciders, cocoa w/ the homemade marshmallows, anything you got! But especially the mulled wine. Pretty please. Abby, you too–go and do, cook and eat! These greens are super easy to prepare; let me know when you make them! Ooh–greens with balsamic. Delightful! One of my favorite combinations. This looks fantastic.